Researchers from City, University of London are collaborating with optometry schools internationally to enhance optometric education. 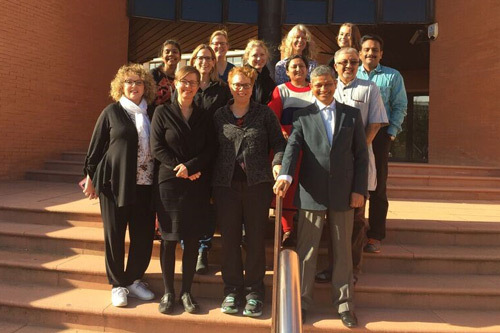 Working with schools in Norway, UK, Spain, the Netherlands, Israel and India, the OCULUS consortium aims to reform optometry curricula and introduce evidence-based practice, bringing optometry education in partner institutions into line with high standards set by the European Council of Optometry and Optics. Involving three institutions in India, three in Israel and four in Europe, the City team – which includes Dr Catherine Suttle, Dr Byki Huntjens and Professor John Lawrenson from the Division of Optometry and Visual Science - will work with their partners to develop content and teaching strategies with the eventual aim that the non-European partners will obtain the gold-standard European Diploma in Optometry (DipE). The project will also bring innovations to optometric education, enhancing the standard even further, beyond DipE. The majority of blindness and vision impairment can be avoided by good eye and vision care and in many regions optometrists are the primary providers of this service. As a result, it is hoped that through reforming the curricula new graduates from the partner institutions will be equipped with the skills to help prevent the onset of such visual disorders. The Israel Council of Optometry and the Association of Colleges and Schools of Optometry in India are full partners of the project with the European Academy of Optometry and Optics and the Norwegian Association of Optometry acting as associate partners. These organisations will ensure that OCULUS outputs are disseminated globally for maximum exploitation and impact.